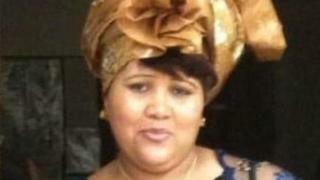 A diabetic prisoner died after being restrained and left on her cell floor for 21 hours, an inquest heard. Four staff members at HMP Peterborough were called in to deal with Annabella Landsberg after she grabbed prison officer Amy Moore's leg in 2017. Ms Moore told the hearing the mother-of-three was "trying to be difficult". She also said Ms Landsberg, 45, had water thrown over her and was accused of "attention-seeking" by a nurse after she appeared to have wet herself. The inquest in Huntingdon, Cambridgeshire, heard that Ms Moore had asked Ms Landsberg to stand for her medication on 2 September 2017. "She said her legs didn't work so she was reaching for the sink," Ms Moore said. "When I stepped over her, she grabbed my leg with both arms." A second female officer then activated an alarm and with the help of two male officers, Ms Landsberg - who was serving four years for offences committed under a suspended sentence - was physically restrained at about 18:00 GMT. Ms Moore told the hearing that the next day, she noticed Ms Landsberg - who was still on the floor - was "mumbling incoherently" so called duty nurse Lesley Watts, who "felt Ms Landsberg was attention-seeking so wouldn't attend". The prison officer said that by 15:00, Ms Landsberg, who was from Worthing, West Sussex, had not moved or eaten her breakfast and appeared to have wet herself so she called Ms Watts again. When the nurse came to the cell, Ms Moore recalled how she told the inmate to "get up" and that she was "pathetic" before throwing a cup of water over her. When a second nurse attended, the inquest heard she "quite quickly" realised the prisoner was in "a bad way" and an ambulance was called. Ms Landsberg, who moved to the UK from her native Zimbabwe, died on 6 September 2017.